Cynthia Appleby and friends was founded in 1995 by Rudy Trouvé and Craig Ward as a 4-track project. A simple rhytmbox, a casio, a lot of electric guitars and a bunch of effects were the instruments. Mostly a song was recorded in an afternoon. Introduction to Dressage is about a little village in Schotland, the noble family ‘Appleby’, and of those especially the youngest daughter Cynthia, who has a fondness for horses, countrymusic, supermarkets, kindergartens, the horse Jeffrey, and a nameless young man in love. The six Cathlenes were recorded the end of 1995, start of 1996, and are about Kathleen, the imaginairy dietician of St. Parc. All music and lyrics are written by Rudy and Craig, except ‘the boxer’, which is originally a Simon & Garfunkel song, and ‘Irrelevant country interlude’, which is Craigs’ mainly. They wave hello like a busload of happy schoolchildren. 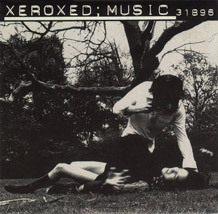 Their one and only release was the promo single ‘xeroxed music’, released in 1996 as a invitation for the opening of a bar in Antwerp. The single was called Kathleen nr.1. The other track on this prome is by the ‘Prefab Allstars’, and was called Xeroxed music.